If you are on the North-South highway heading towards Penang, make a trip to Bukit Tambun for lunch or dinner. Some details can be found on The Sun’s site. It is not exactly our choice location but when you are hungry and the thought of returning to my own island in Penang and the need to search for food again will make us automatically turned into Bukit Tambun. It is conveniently located along the highway and has the fishing village feel and smell to it. Watching the slow moving river is soothing after some 4 hours trip (from KL to Penang). Moreover, my children like the thought of eating the jellies available there. 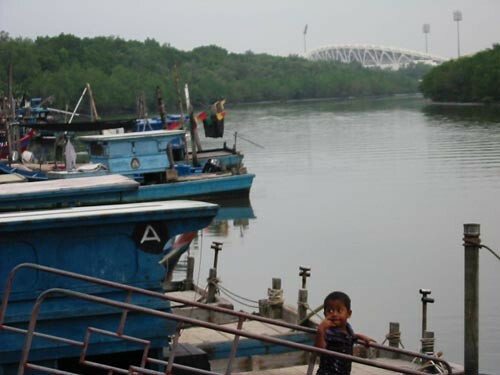 In the above photo, you can spot the Batu Kawan stadium in the background. 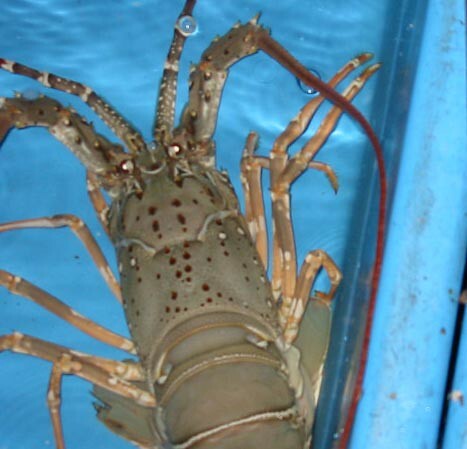 There are several restaurants there offering live seafood. Prices aren’t cheap. Food taste so-so but delicious when famish. Lobsters, oysters, expensive fishes – take your pick. I believe these restaurants are all non-halal. I am not sure which is the best restaurant there. 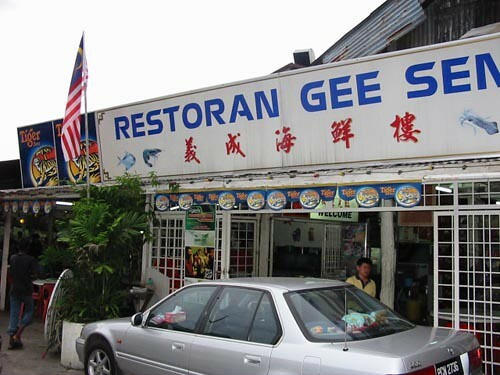 Usually we return to Gee Seng because it is built on stilt and service is very, very fast. (kids like to throw empty shells into the water) Food appears almost instantly after you order. I am not posting any food photos because we ordered the same old boring steam fish, salted fish bee hoon, prawns, tofu and it costs us a whooping RM84. Remember to avoid Prawn Village. We had one unpleasant experience whereby they dished out huge portions of food eventhough we specifically asked for small portions. I dislike restaurants who have no considerations for families with children and out to make money by serving adult portions.